In the time I have been exploring the debates around Chernobyl and Fukushima, I have often been surprised by the extent to which authoritative sources seem to frame their evidence in ways that minimize the appearance of danger. Occasionally, however, one cannot help but be a little awed by the artfulness involved. 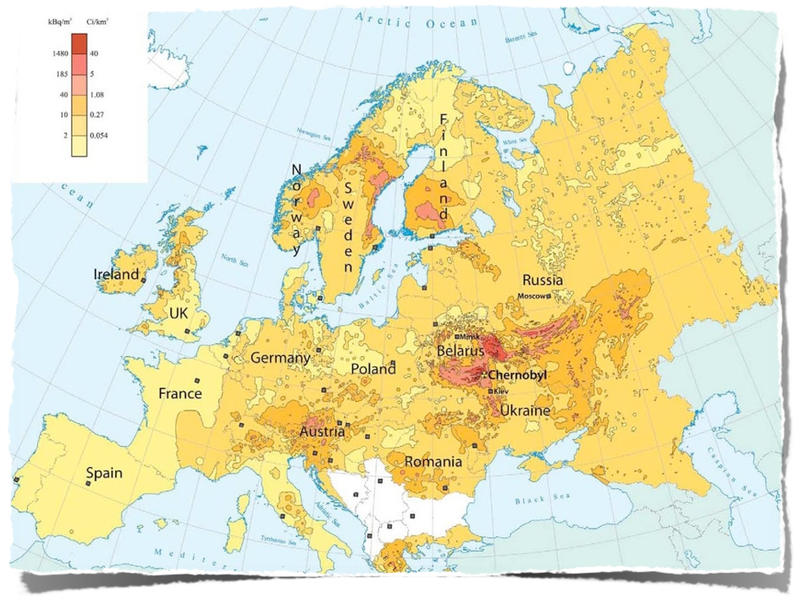 This map – originally created by the Russian Institute of Global Climate and Ecology (IGCE) but faithfully and prominently reproduced by the IAEA in their seminal (2005, also 2006a) 20-year report on “Chernobyl’s legacy” – is interesting and important in many ways. The 2005 IAEA report has become the ‘go-to’ document for authoritative information about the accident’s health and environmental impacts. And although Caesium 137 was not the only radiological pollutant put out by the meltdown, it was the most significant. The map thus represents a central part of a narrative that is deeply implicated in our current energy policies and risk calculations. It is not the integrity of the data portrayed in this map that I will comment on here (although the data is interestingly contested,) but rather the presentation of that data: the map’s semiotics, the logic of its construction, and the relationship of both to the report that reproduced it. Let’s begin with impressions. All images are subjective, of course, but at first glance the map might seem disturbing. Ominous red ink, with its connotations of danger, spreads deep into Western Europe. A band across the Scandinavia reflects the prevailing winds at the time of the accident, and a second ‘hotspot’ hovers over Austria. To me at least, the map suggests an ‘archipelago of hazard’ that links Ukraine and Belarus together with Austria and the Nordic states as partners in radiological hazard. When understood in its proper context, however, the map’s connotations are far more reassuring. To see why a map of radioactive fallout can be viewed as reassuring, it is necessary to look at the argument the IAEA report is making, and the charges to which it is responding. In 1995, with the 20-year anniversary of Chernobyl fast approaching, the accident was undoubtedly going to be in the news. This could have been a disaster for the nuclear industry. The IAEA’s official toll of ‘56 deaths’ simply wasn’t credible by then, and it was highly likely that the media would be seduced by the growing literature attesting to regional horrors and attributing mass deaths to the accident. The IAEA report was an effort to get ahead of the story. Its (now widely circulated and highly trusted) figure of “no more than 4000 deaths due to Chernobyl” does not deny a legitimate ‘mortality crisis’ in the region but, unlike the critical literature, it resolutely refuses to attribute almost any of that crisis to the meltdown. Instead it attributes the well-documented plummet in the region’s life-expectancy to various exogenous factors. Many, the report suggests, are attributable to the socio-economic upheaval that followed the collapse of the Soviet Union and affected the entire post-Soviet block. The more extreme mortality around the plant itself, meanwhile, it attributes to an irrational ‘nuclear fear’ driven by an alarmist media and an infrastructure of compensation. (It argues that when the international community designated the affected population as “victims” rather than “survivors,” people in the region were led “…to perceive themselves as helpless, weak and lacking control over their future” which, in turn “…led either to over cautious behavior and exaggerated health concerns, or to reckless conduct […] and unprotected promiscuous sexual activity” [IAEA 2005]). As far the IAEA is concerned, in other words, the principal thing we have to fear from Chernobyl’s fallout is fear itself. The slightly bizarre (and subsequently ridiculed) charge of death-by-promiscuity was removed from the second edition of the report, but the rest still stands today. Chernobyl didn’t kill people directly, we are told, the Soviet Union killed them by collapsing, the media killed them with alarmist coverage, politicians killed them with compensation, and people killed themselves with their own irrationality. The map is reassuring, at least from the nuclear industry’s perspective, because it appears to support this narrative. It suggests that Norway, Sweden, Finland and Austria were all subject to Chernobyl’s radiological fallout along with Belarus and Ukraine, yet we know that none of the Western European countries suffered a significant mortality crisis after the disaster. Their people faced some restrictions and economic hardships, to be sure. Certain ruminants such as reindeer (in Finland) and wild boar (in Germany and Austria) were kept from the food chain for many years, but there were no deaths or decreases in life-expectancy that were even remotely comparable to those in the East. In other words, the map suggests that the many deaths that some critics attribute to Chernobyl seem to align much more closely with social and political geography than they do with the geography of Chernobyl’s fallout. Its subtext, in essence, is that Chernobyl’s pollution was not so bad as to justify more than 4000 deaths. 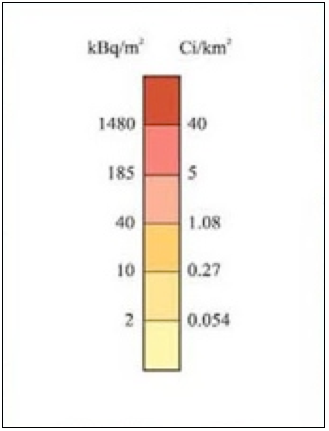 The numbers on either side represent different units of radiation: Becquerels (or kilo-becquerels per meter squared) on the left, and curies (per square kilometer) on the right. Both sides are equivalent so I will speak to the left as it is easier to follow. Ignore the units for a moment, however, and instead look closely at the scale: the different segments, and the colors that represent them. Notice first that anything under 2 kBq/m2 is yellow, (nowhere escapes the palest hint of radioactive contamination). See next that the scale now goes from 2 to 10: a span of eight units, represented by a slightly deeper yellow. Then it goes from from 10 to 40: a span of 30 units, and a still deeper yellow. Pause here to note that there is now a change in ‘color’ rather than ‘hue,’ and we move from yellows to the more ominous shades of red. So the next segment, 40 to 185 kBq/m2 – now a span of 145 units – is light red. The penultimate segment, 185 to 1480 – a span of 1295 units (!) – is darker red. And the final segment, represented by the deepest red, begins at 1480 and has no upper boundary whatsoever. Readers of the report can only speculate what the highest caesium concentrations might be. (Although a different IAEA report [IAEA 2006b] – one conducted concurrently with the ‘Chernobyl’s Legacy’ report but not formally considered in its conclusions – found that concentrations of 90Sr [Strontium, which is generally considered to be a less significant pollutant than caesium] “exceed 4000 kBq/m2 over large areas” around the site of the accident [IAEA 2006b: 3]). And besides, what scale goes from 0 to 2, to 40, to 185, to 1480, to… infinity? It is not linear, clearly, but nor is it logarithmic. I have stared at this scale for a long time without discerning its scientific logic. My only conclusion is that its guiding logic is guided less by science than by an intention to deceive. Look again at the map. Notice that all the ‘red’ areas outside of Ukraine and Belarus fall into the 40-185 range: at least an entire order-of-magnitude lower than some of the levels in the areas around Chernobyl itself, even though the map’s coloring inclines us to equate them. The scale and its coloring, without necessarily lying, artfully occludes the fact that the levels of caesium pollution around Chernobyl were far higher than in other areas of Europe. Now couple this realization (that pollution was far higher around the disaster) with the fact that other countries – including the UK, (which doesn’t even make it ‘into the red’ pollution wise, and is certainly no nuclear critic) – felt compelled to test and restrict the sale of livestock, at great expense, for decades after the accident to protect the health of its citizens. Understand also that Chernobyl sits at the heart of the Dnieper reservoir system: an agricultural floodplain – sometimes described as “the breadbasket of Russia” – where the former Soviet Union grew (grows) the vast majority of its grain (the distribution of which maps clearly onto political boundaries). And suddenly the stories of mass deaths and enormous health costs from Chernobyl become all the more plausible. The IAEA is often viewed as an impartial voice on matters nuclear, but it is important to remember that the organization’s core mandate is the promotion of nuclear power. Some industries have paid lobbyists to defend their interests, others have entire divisions of the United Nations. 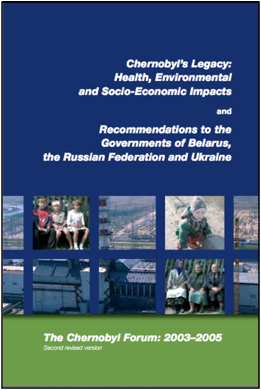 IAEA (2006b) “Radiological Conditions in the Dnieper River Basin: Assessment by an international expert team and recommendations for an action plan” Radiological Assessment Report Series; International Atomic Energy Agency. Vienna. John Downer is Lecturer in Risk and Resilience in the department of Sociology, Politics and International Studies (SPIAS) at the University of Bristol, UK. He has a PhD in Science and Technology Studies from Cornell University, where he wrote about the reliability calculations that frame safety-critical technologies and infrastructures. Prior to Joining the faculty at Bristol he was a research fellow at the Centre for the Analysis of Risk and Regulation (CARR) at the London School of Economics, and then at Stanford’s Center for International Security and Cooperation (CISAC). His current research largely focuses on the knowledge-making, regulation and governance that frame nuclear energy.